Do you happen to have any prepackaged seasoning blends? Like taco seasoning, Dry onion soup mix, dry ranch seasoning? You need to throw them away!! Why? Take a look at the ingredients. You may notice MSG, corn syrup solids, maltodextrin… plus who knows what other mystery spice that you’ve been shaking on your veggies. Don’t worry, I am here to save you from ingesting those nasty little additives, while saving you money! How am I going to do that? 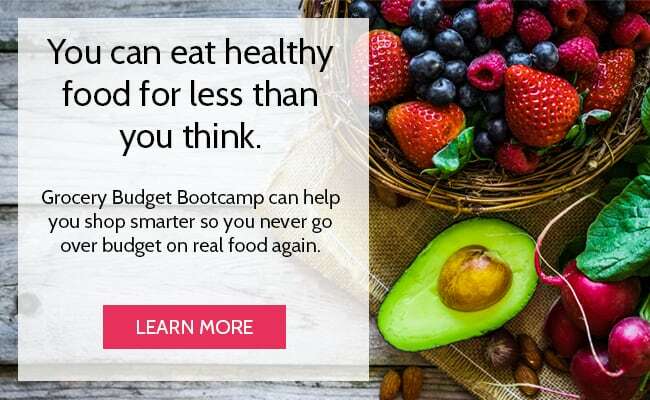 I am going to show you how to make seven of the most popular blends that I use in my kitchen – and I bet you have most of the ingredients right inside your pantry! 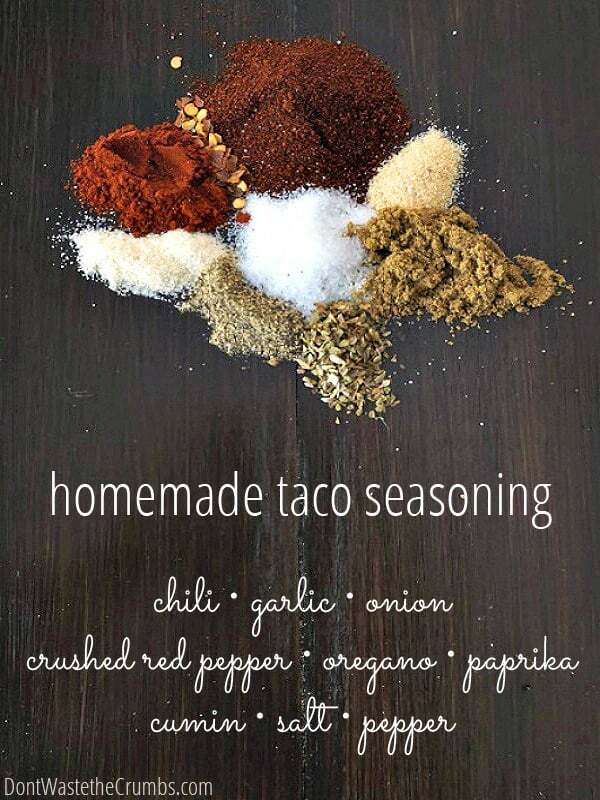 Note from Tiffany: I’ve revamped the Taco Seasoning Recipe and you can find it HERE. Chili is a classic easy dish to feed a family. From bean chili to turkey chili to beef chili, this blend will work perfectly in any chili your family prefers. I find it great in my Sweet Potato Quinoa Chili and my Lentil Chili. 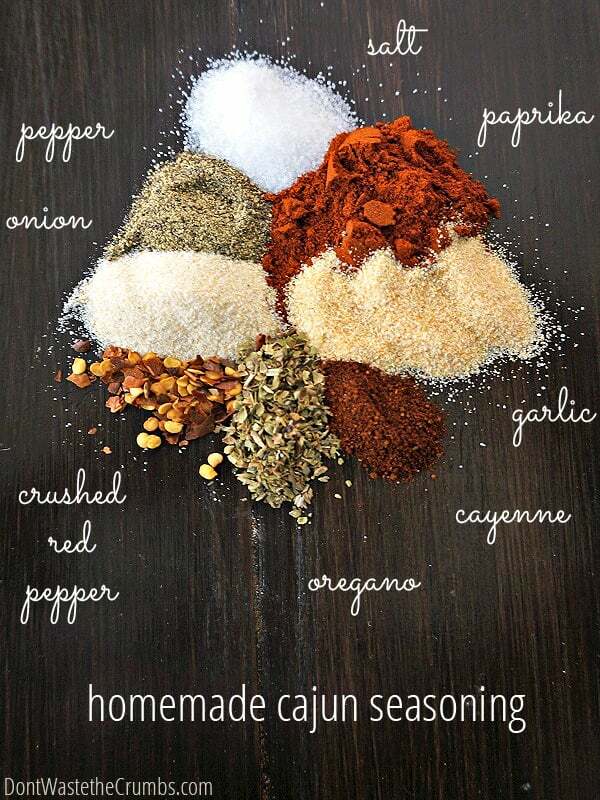 I use Cajun seasoning when making Jambalaya. I also find it is great on baked sweet potato fries, or scrambled into eggs for a spicy breakfast. It’s an easy way to spice up – literally – an ordinary vegetable or side dish! I don’t know about you, but in my house my family wants to dip EVERYTHING in ranch dressing. 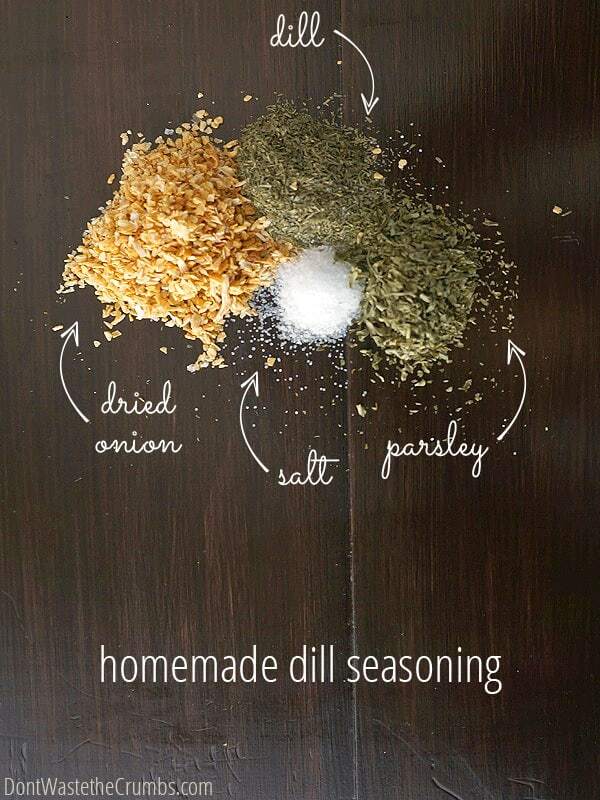 And when I take this seasoning and mix it with 1/2 cup homemade Greek yogurt and 1/4 cup milk, I tell them to dip away! We especially love this ranch dressing with Buffalo Chicken Tacos, Buffalo Chicken Salad , Boneless Wings, and a Cheesy Buffalo Chicken and Potato Bake. Note from Tiff: We make our dressing just a smidge differently. We halve the recipe and mix with 1/4 cup homemade mayo and 3/4 homemade Greek yogurt. The family LOVES it on Southwestern Salad, Buffalo Chicken Bacon Ranch Salad or even mixing it with breadcrumbs when baking chicken! Combine ingredients and store in airtight container. Unlike my family, I am not as obsessed as dipping my veggies in ranch dressing. I grew up dipping my veggies in my Papa’s Dill Dip. It is simply 1 cup mayo and 1 cup sour cream mixed with this seasoning. You can also make it with 1 1/2 cups Greek yogurt and 1/2 cup sour cream. Either way it is a bowl full of YUM. This spread is also great for anything Greek. I use the dry seasoning in my Mediterranean Chickpea Salad. It would be great to season meat for gyros as well. 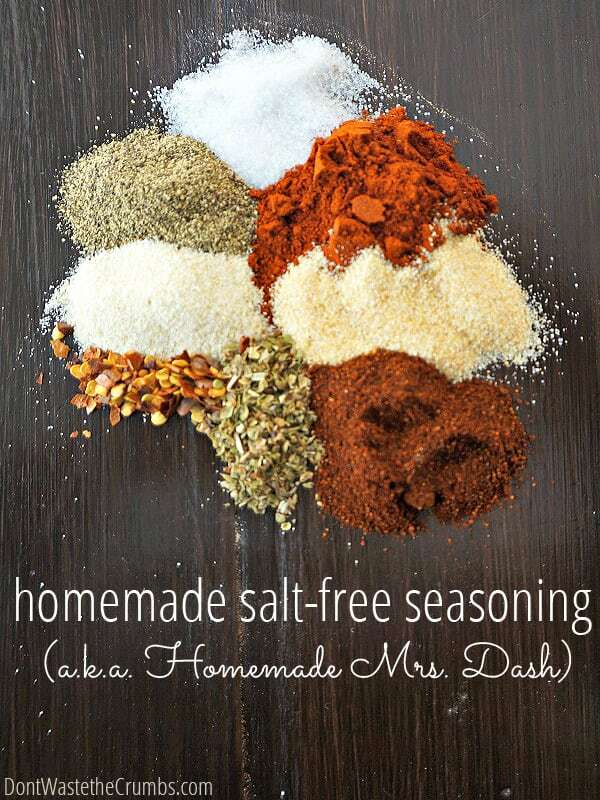 Seasoned salt adds SO much flavor to a homemade dish. This salt can be used on just about anything, from potatoes, to soup, to casseroles. I find that adding it to Broccoli Cheese Soup or Ham and Bean Soup adds a layer of dimension that can not be replaced with regular salt. Now that you have all these handy spice blends, how should you store them? Well, a ziploc baggie would work, but is not very handy for scooping from. Personally, I use tiny glass jars. You can use glass canning jars like these little 4 oz jars, these spice jars, wash out old empty spice jars, pickle jars or even baby food jars and re-use those for your spice blends. I try to reuse as many things as I already have. 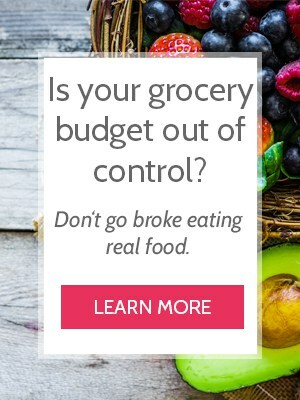 Just another way to save money!! Where you buy spices depends greatly on your grocery budget. Local dollar stores will have individual spices for $1 per container, or you can buy them for $3-4 per container at the grocery store. Online, Amazon has the best deal and you can find great quality. You can use quality ingredients that serve more than one purpose, mix your spice blends to suit your family, and have the blends you need readily available. To store your spices reuse old jars and remove the labels or buy these cute spice jars from Amazon. As a big fan of having things that serve more than one purpose, these 4 oz mason jars are perfect for spices, serving chocolate avocado mousse, and storing homemade toothpaste! 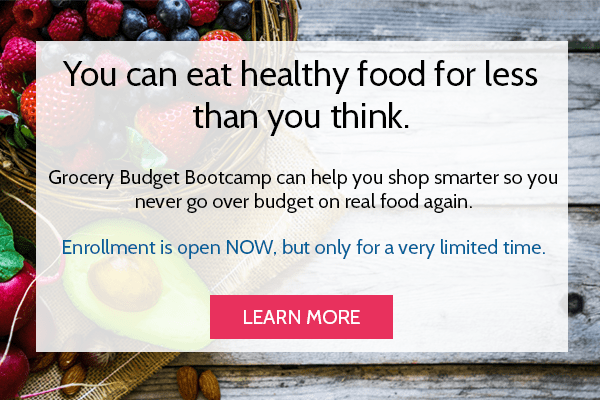 Learn more about the BEST ways to save on groceries through my signature eCourse Grocery Budget Bootcamp. 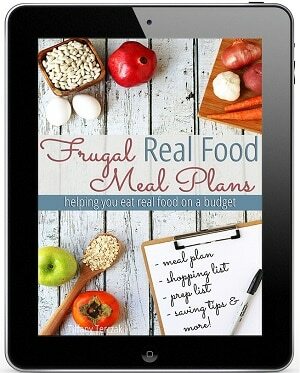 Food priorities, making things from scratch, and stocking a real food kitchen are all included! Is there a spice blend that is a must-have in your cupboard? Do you make it homemade? Or do you buy it? We’d love to hear how you creatively use your blends! 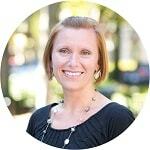 This post was written by Kristen at A Mind “Full” Mom. Hello! 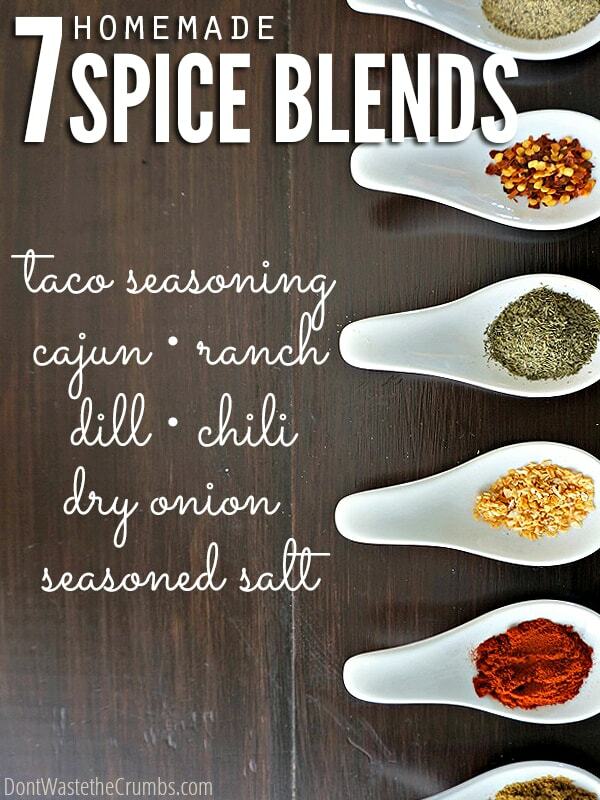 These are great…so nice to have post compiling several different spice blends in one place! I’ve been doing my own spice blends for a while now but haven’t found any recipes to really be loyal to, maybe these will be it. One thing I did want to ask though…several of your recipes call for “chili powder” in rather high quantities…are you referring to the spice blend known as chili powder, or actual straight powdered chilis? I’m an American currently living in Australia, and here there is no American style chili powder (which is a blend of powdered chilis, other herbs and spices, and sometimes salt), but they do have “chilli powder” which is straight up powdered (extremely hot!) chilis..it produces very different results in recipes than typical American chili powder. Based on the quantities in your recipes, I’m guessing you mean American style…if that’s the case it’s amusing that diy spice blends require yet another spice blend! 🙂 Regardless, could you clarify so I can attempt the recipes correctly? Thanks so much for the post! Hi Victoria! I believe Kristen was referring to powdered chili, not a chili blend itself. I’ll double check with the author though and have her chime in! Hey there Victoria. I do in fact mean powdered chilies–not a blend. They do add heat to a dish, but not extreme heat. Maybe the type of chili’s they powder in Australia is strictly made from Cayenne peppers and not red chili peppers, like it is here in America? Cayenne peppers are certainly quite a bit hotter! Yes, the ranch and dried onion recipe are equivalent to what you would receive in one packet of store bought mix. You can use either one–they are the same. Super fabulous! What a great idea and great resource I’ll keep on hand! I’d love to dry the homemade onion dip! How much sour cream would I need to combine with the recipe above? Hi Kim! I believe most recipes call for 16 oz of sour cream – one container. I’d start with half though, and then add more to adjust to your taste. You can always add more sour cream, but you can’t take it back out! Great advice Tiffany 🙂 You can add in more sour cream as you desire, but this anywhere from 8 oz to 16 oz is good! I saw your other ranch post and it is 8 servings and you mix 1tb with 1/2 cup yogurt and 1/4 cup milk. Is this one 8 servings when making ranch like that also??? or is that really 1 serving size??? 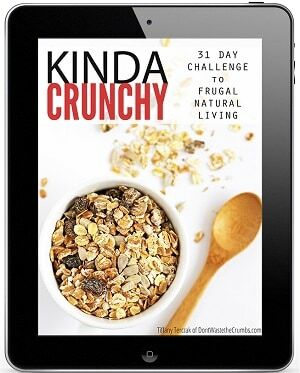 Stephanie – I’ve been experimenting with this same recipe this week and here’s what we’ve done: cut this dry mix in half and mix with 1/4 cup mayo and 3/4 cup yogurt. Add milk 1 Tbsp at a time to thin and only if needed, add a teeny splash of lemon juice for tang (only if your yogurt is on the mild side usually). Kristen will see this and I’ll let her chime in with her rendition too! I forgot to ask can you mix fresh and dried spices? I was thinking about growing some parsley. Hi Stephanie! For a dry mix in long storage, it would be best to use only dried spices. You can grow parsley and then dry it, or make the mix minus the parsley and then add that fresh to your recipe! I think your site is very well done and enjoy the info. I have a question? How do you heat the milk for yogurt. It seems to take so long it’s an all morning affair maybe am doing it the hard way. Hi Deborah! When I heat milk for yogurt, I use the stove. It takes about 20 minutes to heat up, but an hour to cool if I leave it on the stove. Moving the cooling milk to a cooling rack on the counter speeds up the process significantly! I hope you enjoy the recipes Cecelia! My prayers are with you and your family and I hope your dad can beat the cancer! I love these home healthier season mixed. It would be helpful to know how much each make…how many ounces for instance. Some of these one might want to double or triple if used often. Thank you! I was wondering about all the spice blends and want to know if they can be stored in the freezer so they last longer. I love bulk spice blends but it is just me and my husband so we cannot go through it all in 6 months. I dont want to cut down the recipe, I just want it to last me longer. Is the taco seasoning recipe as written considered mild, medium or hot heat? Thanks. Great seasoning recipes Tiffany! I’m a big proponent of home made seasonings myself, as all the store bought ones are exorbitant for the measly quantities. Here is one zesty seasoning I make and keep on hand at all times, they are great for potato wedges and French fries. You may want to add it to the section. I add all the ingredients to a mortar and pestle and gently pulverize them until homogeneously combined. Thanks for sharing a great recipe Aditya – question, is there a substitute for the citric acid? Maybe a citrus zest? Yes, citrus zest should be fine. Basically any souring agent will do. But citrus zest affects the shelf life, so can be used for a small batch.I’m trying tamarind, which has a lot of moisture. Need to sun dry it thoroughly though. I guess you are averse to using citric acid, be rest assured that food grade citric acid is safe, commonly used and more importantly cheap.